Temple Institute's Rabbi Richman responds to claims that escalation of violence in Jerusalem is fault of Jews ascending the Temple Mount. Ongoing violence in Jerusalem has seen Arab extremists targeting Jewish residents and security forces alike - as graphically illustrated in today's deadly attack, in which a terrorist plowed his vehicle into a group of pedestrians, killing one man and leaving more than a dozen injured. But in no place has what residents are now terming a "silent intifada" been more pronounced than at Judaism's holiest site, the Temple Mount. Islamists, determined to prevent Jews from even visiting the site - where they are already forbidden to pray - have been conducting a near-daily ritual of violence, which culminated last week when activist Yehuda Glick was shot in the chest by a terrorist in an attempted assassination. Some have attempted to suggest that the escalation is a direct result of Jews ascending to the Temple Mount, with the Palestinian Authority and Islamist groups using Jewish visits as an excuse to fuel the fire. Abbas has repeatedly condemned any sort of Jewish presence on the mount, calling Jews who do visit the mount "invaders" and "settlers," and suggesting that "[Jews] have no right to enter it. They have no right to defile it. 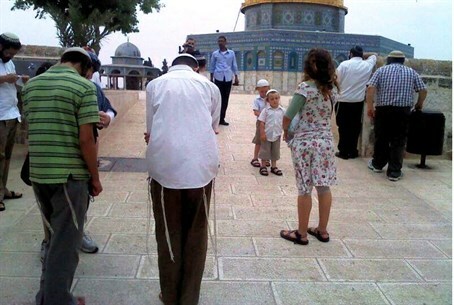 We must prevent them" - despite it being their holiest site. In a statement released Tuesday by his spokesman Nabil Abu Rudeineh, Abbas yet again warned against the “break-ins by the settlers and Jewish extremists” to the Al-Aqsa Mosque, calling these actions a violation of Muslim feelings. Rabbi Chaim Richman, the Temple Institute's International Director, responded to these claims, noting that attempts to blame Jews peacefully ascending the site for "provoking" a reaction "is an exercise in blaming the victim." "These attacks are being blamed on [Jewish] people who are simply exercising their democratic and basic human civil right" to go and pray at a site that is holy to them, he noted. "Of course it's easier to blame the victim than deal with the actual perpetrators of the violence, but that doesn't make it accurate." Rickman called the surge of Jews visiting the Temple Mount a "spiritual awakening," as Jewish people attempt to reclaim their holiest site which they were historically barred from visiting by successive occupying powers. This is the nation of Israel waking up to correct the terrible historical wrong of the fact that we've turned our back on this place as a result of being forcibly kept away from it for so long." He described the violence as "the death throws" of the Islamic monopoly over the site. "When we [Jews] go there...they [Arabs] realize that we're coming home. This is why they feel threatened." Speaking about Glick, Richman described him as "a real life Jewish hero," and had harsh words for the media portrayal of him as "extremist." "If you think a person whose entire life has been for peaceful prayer is causing incitement and asking to be killed, then there is something very wrong with the way you view the world." "This is a man who openly and repeatedly called for tolerance on the Mount; for Jews and Muslims alike to be allowed to pray in the spot that is, after all 'a House of Prayer for all the nations," he said, citing the Biblical description of the Jewish Temple. "There is only one party here being 'hardline' or 'extremist', and that is the Islamists who refuse to allow Jewish people the equal right to pray on the Temple Mount!" In response to the question of whether there is a peaceful solution to the struggle over the Temple Mount, Richman offered Ma'arat HaMachpela (Cave of the Patriarchs) in Hevron as an example, where a complex but generally effective system splits the compound between Jews and Muslims, with minimal friction. Richman concluded with a challenge to authorities. "All we're asking for is the chance to pray. Give us 2 o'clock in the morning. If this our slot, go up for 45 minutes at 2 o'clock in the morning, and pray. I don't see why that can't be done without evoking negative responses."